Seated on Mingfeng Mountain 10 kilometers east of Kunming, it is the largest pure copper temple existing in China at present. 1 Seated on Mingfeng Mountain 10 kilometers east of Kunming, it is the largest pure copper temple existing in China at present. The Golden Temple weighs about 200 tons, with 180 square meters in area. The building structure completely imitated wooden structure being made of copper. The building shows fine workmanship. The Golden Temple being preserved was rebuilt by Wu Sangui in the Qing Dynasty over 330 years ago. 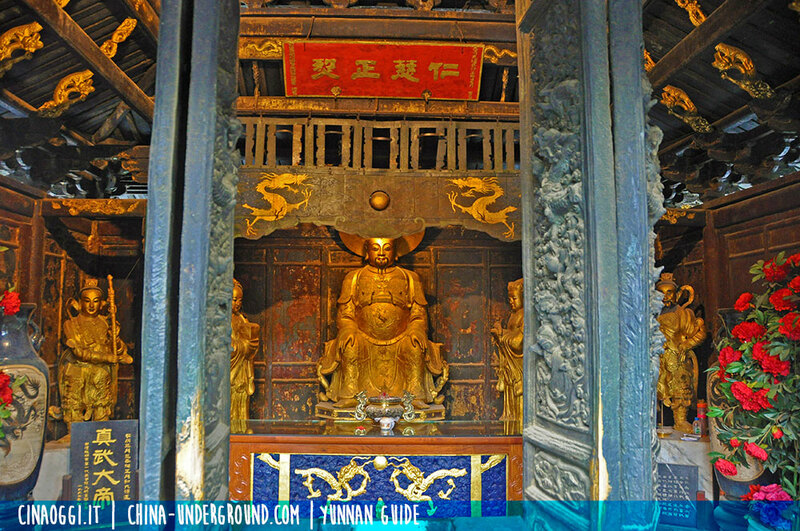 A group of Taoist ancient architectures is kept here, all are excellent copper casting works. Golden Temple was built under the instruction of Mr. Chen Yongbin, the then Governor of Yunnan Province in 1602 in the late Ming Dynasty. The legend tells that this building came out of an interesting dream of Chen Yongbin which goes as follows: One night, Governor Chen Yongbin had a dream in which he met Lv Dongbin, one of the eight immortals in Daoism, who told him that he would like to meet Chen on Phoenix Singing Hill the next day since Chen was so keen on Daoism. Governor Chen was very happy and he went to Phoenix Singing Hill early next morning. At the foot of Phoenix Singing Hill, he saw an old man in rags cooking potatoes with a marmite covered by another as a lid and a goat was tied to a tree nearby. Governor Chen walked around the hill for a whole day but couldn’t find anybody there. He was very puzzled when he stepped down to the foot of the hill because the old man disappeared and there were even no ashes at all left on the ground where he set the fire to cook potatoes. The rope-tied goat had also disappeared. He suddenly realized that 2 marmites, one set above another, make a Chinese word Lv (吕) which was the surname of the immortal. Cooking potatoes in Chinese pronunciation “dunyang” was a homophonic word of the title of Lv Dongbin “Chunyang”. The old man cooking potatoes there was just the immortal Lv Dongbin himself! Governor Chen couldn’t recognize the immortal because he only had mortal flesh eyes. He missed the chance to talk to the immortal because he was not predestined. But he was still happy because he saw the immortal when he arrived and he decided to have a Daoist temple built on the Phoenix Singing Hill. Over Qingyanghe River, an ancient bridge still spans it. This bridge is called Immortal Bridge (Yingxianqiao) because Governor Chen Yongbin met the immortal there. A stone stele called Stele of Patriarch Lv (Lvzubei) described the event and time and the sandstone stele set by Governor Chen Yongbin has the following words on it: Road to Patriarch Lv of Superb Moral Integrity of Tang Dynasty (“Tang gaofeng zhengjie Lvzhenren donglu”). The next site is a sandstone archway called “Feng Ming Sheng Jing” (Phoenix Singing Scenery). The Chinese word “feng ming sheng jing” was carved on the front side of the horizontal inscription board of the archway and another Chinese word “Yu Xu Kong Qu” (An Opening to the Jade Heaven) was carved on the backside of the board. Climbing 72 stairs after the Archway of Phoenix Singing Scenery, one can reach the First Heavenly Gate. Seventy-two steps symbolize the 72 earthly stars in Daoism. Thirty-six stairs after that are the Second Heavenly Gate. Thirty-six stone steps symbolize 36 heavenly stars in Daoism. Together, the 108 stone steps symbolize that the Heavenly Gates are protected by the heavenly gods and the star spirits. According to Daoist Canon, the 108-star spirits are all in the Big Dipper under Xuanwu God, the god of North Heaven or Zhenwu God and the God of the True Martial Art. 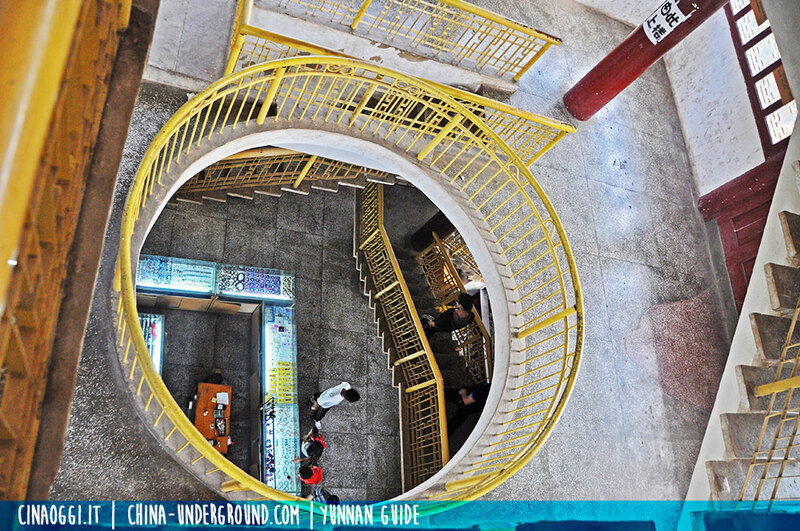 Therefore, climbing up these stairs means that one is entering the dharma gate of God Zhenwu. And then one can walk some distance to the Third Heavenly Gate. These three “Heavenly Gates” represent the three realms, that is, the realm of Precious Purity, the Realm of Lofty Purity, and the Realm of Absolute Purity, which are considered to be the highest world of the Daoist hierarchy. 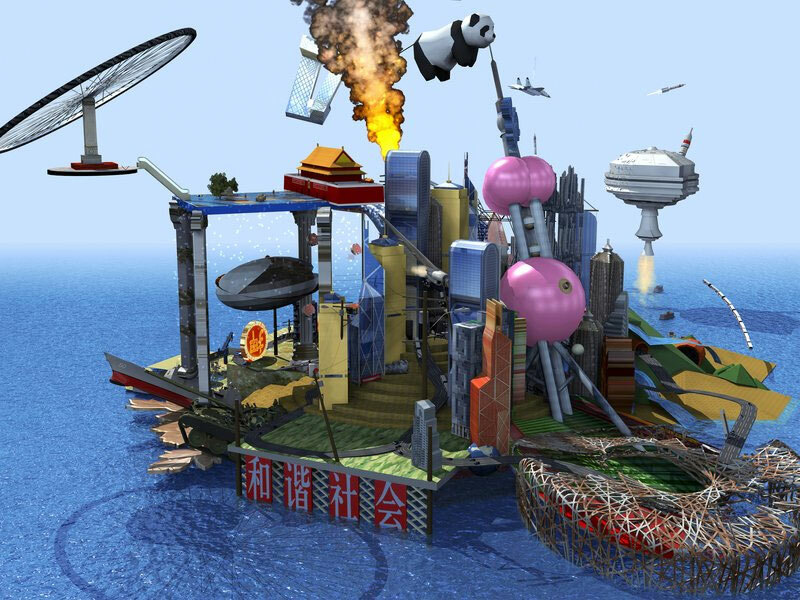 Under this is the Trayastoinisas, the 33 layers heaven realms. The 3 realms are respectively held by 3 gods, which are the God of Prime Origin, God of Sacred Jewel, and God of the Way of Power. Hence walking into the Three Heavenly Gates along all the steps with no fear of hardship in pursuit of Daoism, one is surely able to reach the ultimate realms. All these Three Heavenly Gates were built in the period of the 30th year of Wanli Emperor of the Ming Dynasty (1602). The Heavenly Gates were built with architectural characteristics of a system of bracket inserting across, a precise carving of many different patterns and colorful paintings. The gates look towering and lofty and imposing, incarnating the architectural style of Daoist temple with quietness, peculiarity, and precipice. After the Three Heavenly Gates is a formal Daoist temple complex. On the red wall of Taihe Palace (Palace of Great Harmony) are four big Chinese characters “Ying Wu Chun Shen”. They were written in late Ming dynasty and indicate that “the Parrot Mountain is always permeated with strong spring atmosphere”. This gives visitors a feeling of a warm spring season once on this spot. On the archway, there is a couplet which read: “A Hundred feet high is the Heavenly Platform with Bamboo swaying in the east, a half green mountain and a half floating clouds; The three thousand world is full of Daoism with Shanggu dragons flying above, a unique jade universe and a unique shrine land”. 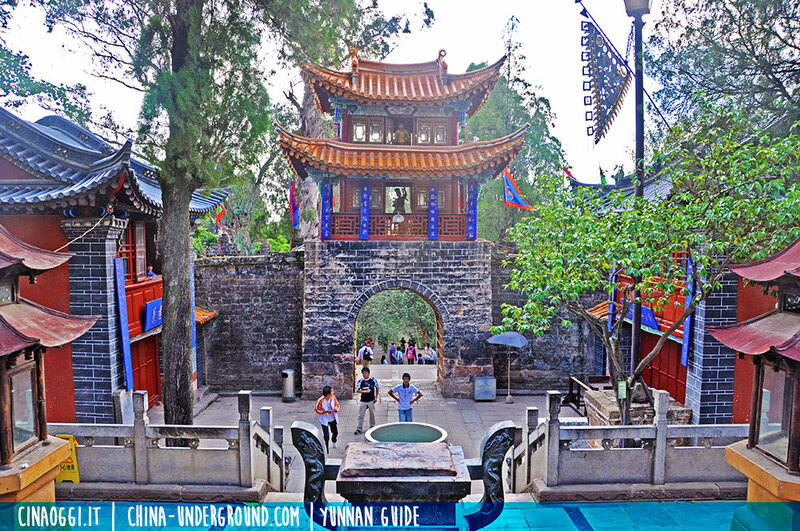 The heavenly platform refers to the Phoenix Mountain top where Taihe Palace was built. Bamboos in the east refer to the bamboo bush in the east part of the temple. The first part of the couplet shows a beautiful landscape of the Golden Temple. Didao (conduct of the Great God of the True Martial Art Zhenwu God) refers to Daoist power (Daoism), three thousand refers to the whole world, Shanggu was a prefecture name of Qin Dynasty (221—207 B.C.) and refers to the north of China where Xuanwu God (the god of the north) originated. Shanggu here metaphors that the place of the Golden Temple is an incomparable wonderland where even dragons fly up (Daoism thriving). The second part of the couplet praises the wonder of the Golden Temple. The couplet was written in Li script and it is known as one of the best couplet calligraphic works in the scenic spots of Kunming. Besides, the Lingxing Gate are the status of a dark lion and a white elephant. They are animal protectors often found in Buddhist temples. Their existence here indicates that Buddhism is mixed with Daoism in this temple. On the sides of the lintel are the characters “Dong Tian” and “Fu Di” (cave heaven and fortune land). The occurrence of the Lingxing Gate, lions, and elephants, and the characters “Dong Tian” and “Fu Di” is a symbol of the Trinity of three religions, namely, Buddhism, Daoism and Confucianism. It also indicates that this temple has a mixture of different cultures for a harmonious society in the Song, Yuan, Ming and Qing dynasties. The garden yard of the temple complex lies next to the Lingxing Gate. There are many different ancient trees in the yard such as cypresses, magnolias, camellias and crape myrtles. There are also lots of flowers such as flowering crabapple, scarlet sage, chrysanthemum, monthly roses, dahlia, fish pelargonium, orchid, plums as well as quite a few Australian tree eucalyptus planted in the yard with the result that there are flowers blooming all the year round. A walk through the yard leads to a fort-like building. This is the “Forbidden City” built with dark bricks. Small and exquisite, this Forbidden City has crenellations on the city wall around and arches over the gateways and it can be called the smallest city in China. Right in the middle of the Forbidden City stands the old but elegant Golden Temple. The original Golden Temple was built in 1602 of late Ming Dynasty. The existing Golden Temple was built in 1671 of the early Qing Dynasty. Although named like this, the temple is actually made of copper. 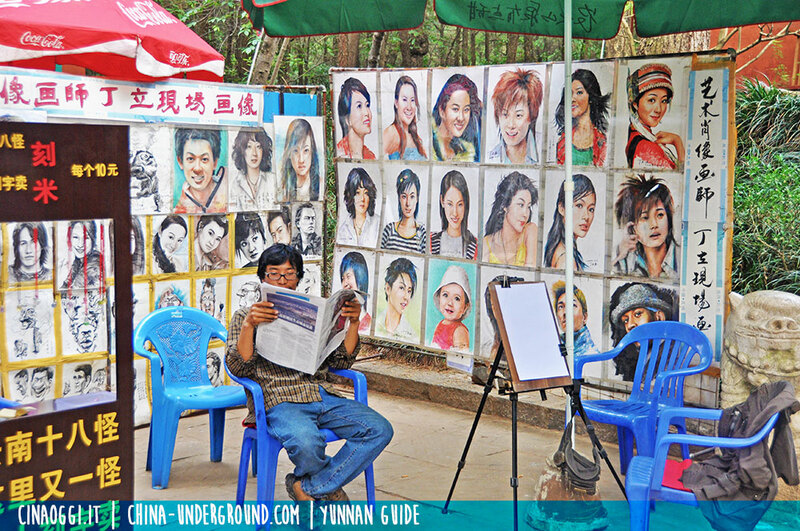 Yunnan is a province with a long history of copper mining and smelting which can date back to the ancient time. During the Ming and Qing Dynasties, Yunnan was the biggest copper producer in China and copper products from Yunnan were transported to Chenglingji, a town in the middle reaches of the Yangtze River near Wuhan, to mint coins. 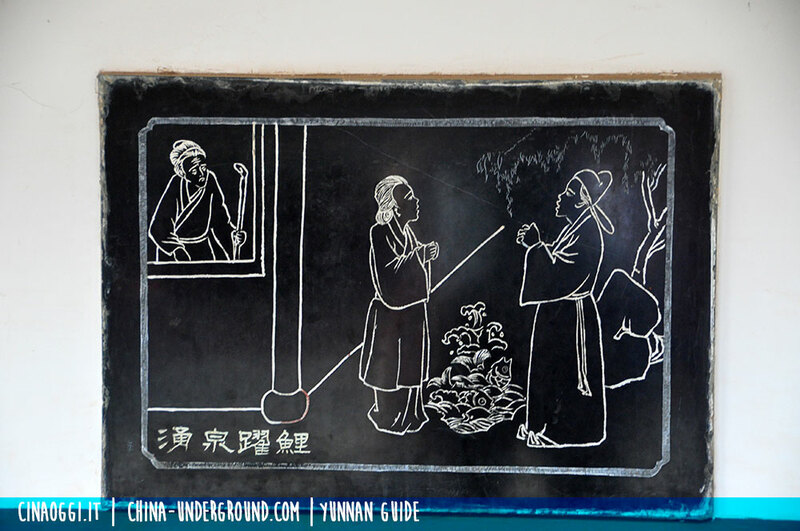 Due to the warfare in late Ming Dynasty, the transportation had to be stopped and copper was piled up in Yunnan. 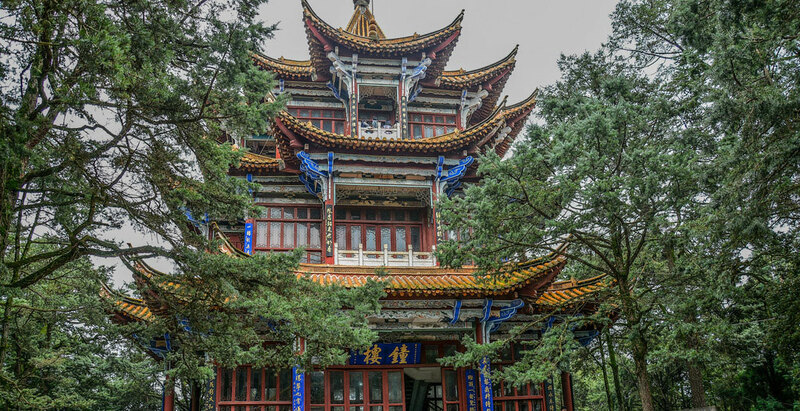 Daoist Xu Zhengyuan, an abbot of Parrot Mountain Daoist Temple, suggested to Mu Changzuo, the Hereditary Duke of Yunnan, and Chen Yongbin, the governor of the province, that a Daoist temple of copper and bronze pieces be built. The suggestion was to build a bronze temple in the model of the Golden Temple on Tiandu Summit of Wudang Mountain to enshrine and worship “God Zhenwu”, the Great Emperor of True Martial Art of the Lunar North Mansion. Duke Mu Changzuo and Governor Chen Yongbin took his advice and started the project. The construction of the Golden Temple was completed in the 30th year of the period of Wanli Emperor of the Ming Dynasty (1602 A.D.). The temple was made of copper and bronze pieces and painted with gold powder. It was glittering and thereafter named the golden temple. In the 1630s, the peasant uprising broke out in many parts of Ming Empire and this greatly shook the regime of the Ming and the regime of Duke Mu Family in Yunnan. The Mu’s power in Yunnan was declining. Mu Tianbo, the last duke of the family, couldn’t find the reason of the political wrongs of the administration and he only asked the geomancer to judge the reason and find a way out. The geomancer said that the metal copper was one of the five elements and that metal could check wood. The word wood in Chinese was pronounced “mu” symbolizing the name of the duke family. Therefore the geomancer and Duke Mu Tianbo attributed the social chaos to the construction of the bronze temple because metal cut the wood the “Mu Family”. For this reason, he ordered Zhang Fenghe, the then governor of Yunnan Province, to move the temple away from Kunming to Jizu Mountain (Chicken-Foot Mountain) in Dali to calm down the social disorder. Unfortunately, the Ming Empire was overthrown 7 years later by peasant uprising; so was the Mu Family 25 years later in 1662. The Qing Empire replaced Ming in 1644 and unified the whole of China over a period of about 20 years. The original golden Temple was destroyed in 1966 during the “Cultural Revolution”. After an instigating speech of an official at that time, the local people rushed to Jizu Mountain and turned down the temple and sold it as scrap metal to the local recycling company and with the money, they bought three tractors. The present Golden Temple open to the public was rebuilt in 1671 A.D. by Wu Sangui, who reigned over Yunnan during the Qing Dynasty. He spent a lot of money to build this golden temple with a purpose to strengthen his regime. High under the roof beam of the temple are inscribed with the words: Established by Wu Sangui, Prince of Pingxi (a titled prince of west conquest or of west expedition), on the 16th of Dalv Month (December 16th), 10th year of the Period of Kangxi Emperor of Great Qing Dynasty (1671 A.D.). The Golden Temple was made of copper and its alloy bronze pieces with a pseudo-wood structure of double eave roof on its gables. The frame was fixed in a traditional Chinese structure of Dou gong (i.e. a system of brackets inserted between the top of a column and a crossbeam). It is 6.7 meters in height, 7.8 meters in both width and length, and about 250 tons in weight. Its beams, columns, roof, bucket arches, decoration figures, statues, streamers, horizontal and vertical inscription boards, and other parts, are all made of copper or bronze. The 6 doors in the front were engraved with dragons, clouds, and water, the walls on the three sides were cast in China knot patterns each with a Chinese word “longevity” carved on it. On the upper parts of the 4 outside columns, Buddhist signs were cast. On the roof, dozens of human, animal statues and a nice engraved dragon ball were decorated for the purpose of protecting the temple. The construction of the whole temple shows an amazing technology of metallurgy, casting, engraving and architecture of Yunnan in late Ming and early Qing Dynasties. On the altar inside the temple, the statue of God Zhenwu, Great Emperor of True Marshal Art of North Polar Palace or the God of China Marshal Art, sits solemnly and auspiciously. On his right and left sides, stand the Golden Boy and the Jade Girl, and further, the two generals Turtle and Snake. Up at the front side of the temple is a metal board inscribed with Chinese words “Nan Wu Liang Shou Fo” meaning Amitabha Buddha. 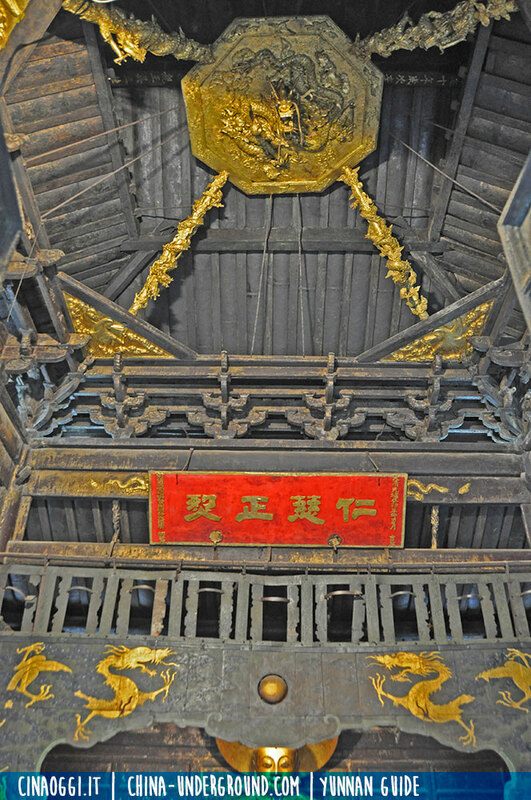 Behind it hangs another board with the words: “Bei Ji Xuan Wu”, the God of Northern Lunar Mansion. The base of the platform is a two-layer Sumeru structure. Two layers of rails were set and on the outer side of the railing, 24 relief pictures were engraved with the stories of 24 filial pieties. This design vividly characterizes the trinity of Confucianism, Daoism, and Buddhism. In front of the temple and on the right is a copper flagpole of 10 meters. The flagpole is engraved with the pattern of the Sun, the Moon, and the Big Dipper, the Lunar Mansion and 4 Chinese characters: “Tian Xia Tai Ping” (Peace reigns under the Heaven). On the ribbon, 8 Chinese characters are engraved: “Feng Tiao Yu Shun, Guo Tai Min An” (wind and rain come in time, the country is prospering and people are in peace). The flag symbolizes God Zhenwu’s idea that the world is under his universal protection and also the general wish of the people in a feudal agricultural society. Going out from the west gate of the “Forbidden City”, one can come to a clean and nice old courtyard with a structure of China’s traditional quadrangle on the west side of the Golden Temple. This courtyard is now called the Museum of the Golden Temple. In the museum display such as General Wu Sangui’s broadsword which weighs over 20 kilograms. 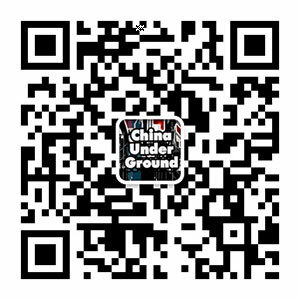 Wu Saigui used it in his battlefield in late Ming and early Qing dynasties. In the same room is another special sword called the Great Dipper Sword for subduing demons. It was used by the Daoist priests to subdue the demons in the old days. It is about 1.5 meters long and 15 kilograms in weight. In other rooms are displays of ancient stone pieces, bronze pieces and paintings of the Qing emperors. In the south of the museum is another garden yard with the miniatures of 5 golden temples extant in China. This garden is called “China Golden Temple Exhibition Center”. It was established in 1995. All the miniatures were carved out of nanmu wood at a ratio of 2∶1, and they are coated with copper and are of pseudo-copper wood structures. These five golden temples are: Baoyun Pavilion the Longevity Hill in Summer Palace in Beijing, established in 1755 (the 20th year of the period of Emperor Qianlong), with a weight of 207 tons; the Golden Temple on Tiandu Summit of Wudang Mountain, Hubei Province established in 1416 (the 14th year of the period of Emperor Yongle of Ming Dynasty), with a weight over 80 tons; the Copper Palace on Wutai Mountain, Shanxi Province in 1602 (the 30th year of Emperor Wanli of Ming Dynasty), with a weight of 50 tons; the Golden Palace on Mount Tai in Shandong Province in 1615 (the 43rd year of Emperor Wanli of Ming Dynasty), with a weight of 60 tons. This exhibit shows the magnificence and splendor of the original golden temples in China. It also shows that the Golden Temple in Kunming is ranked No.1 Copper Temple under heaven by comparison of the size, weight and time of building. Going out from the north gate of the Forbidden City, and walking through an osmanthus garden yard, one can come to another temple in which enshrined Lord Laozi, the founder of Daoism. Inside the temple is the statue of Laozi riding a black bull. On the walls are hung paintings of the biographic stories of Laozi. On the front wall and in the corridors are black stone pieces engraved with the pictures of 24 filial pieties. The Garden of Yunnan Bronze Culture lies in a quiet forest. 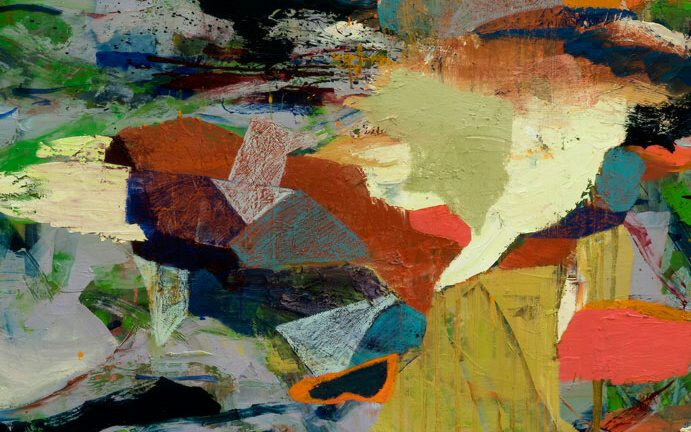 It is a mirror of the Dian Kingdom and a reflection of the society on several aspects of that time. In the building is displayed the Seal of Dian King Political Evidence. In 109 B.C. Emperor Wudi of West Han Dynasty promulgated a gold seal to Changqiang the King of Dian Kingdom, politically showed the existence of the kingdom in Yunnan 2,000 years ago. The seal was discovered on December 28, 1956, at Shizhaishan Mountain in Jinning County, 40 kilometers southeast of Kunming City. The seal here is a replica and it is about 50 times bigger than the original. There is a cowries bronze container, which showed that there was already a surplus value in the Dian Kingdom and the sea shell cowries already prevailed in Dian society as money. The king and his officials could collect cowries and stored in the container and this container can be considered the forefather of Bank of China. 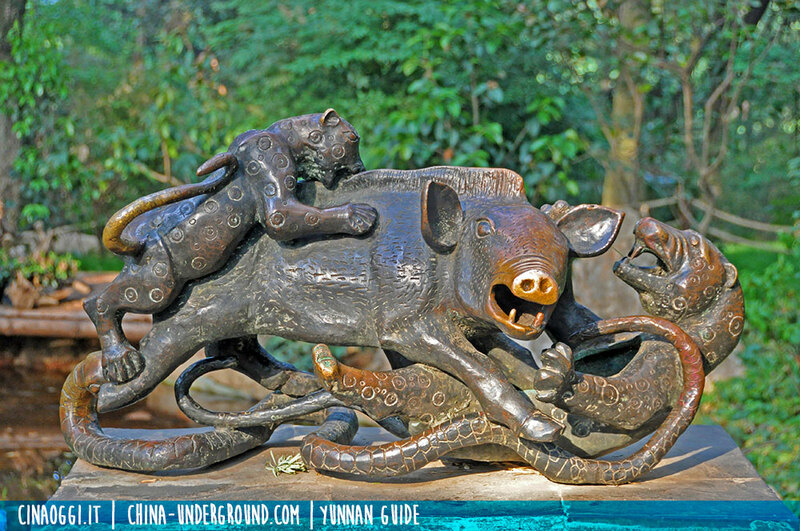 Ox-Tiger Bronze Table was discovered at Lijiashan, Jiangchuan County in 1972. Ox-Tiger Table was used as a table for offering sacrifices to gods or ancestors in the old time. It shows the religion of Dian Kingdom. The bronze ox heads (single head and three heads) were discovered at Lijiashan Mountain in 1972 and also used as offerings to the god and ancestors in the Dian Kingdom and it is the evidence of religion in the ancient time. The bronze pillow in shape of ox horns with eight smaller horns on the front side was discovered at Lijiashan Mountain in 1972 and used as a massage pillow in the ancient time and it shows the medical science of Dian Kingdom. Bronze drums were discovered in many places in Yunnan. The oldest one is 2,700 years old and was found at Wanjiaba, Chuxiong City in 1974. 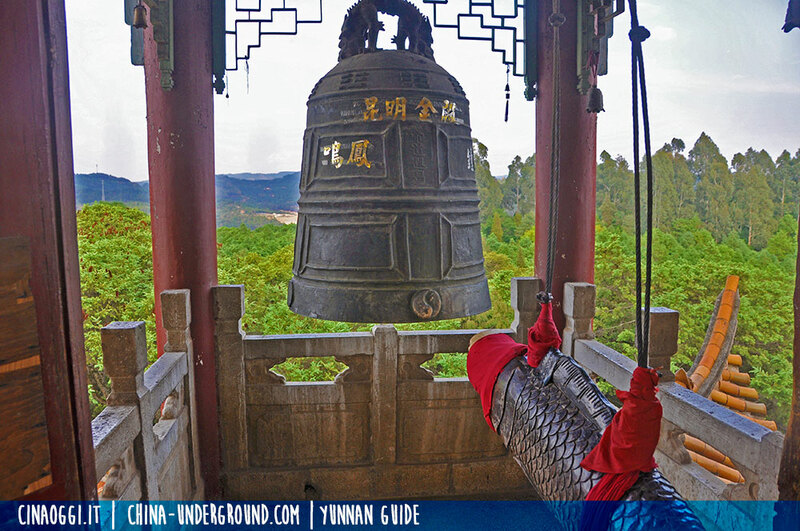 It is considered to be the oldest in the world thus Yunnan is repudiated as the origin of bronze drums. Bronze drums were used as cooking pots, music instruments and containers in the old time. The bronze reed pipe was dug out at Lijiashan in 1972. It was a marvelous discovery in Yunnan. Everyone knows that the wonderful musical instrument reed pipe was made of gourd and bamboo pipe or reed pipe. The bronze one found in the tomb of the Dian nobles shows that the Dian people were already able to make musical instruments and play and even made the bronze copies to be stored in the tomb. This helps to trace the musical science back to 2,000 years ago. On the top of the Phoenix, Singing Hill stands a towering pavilion. This is the Bell Pavilion where the famous ancient Yongle Bronze Bell is hung. The bell pavilion was built in 1983 and is 29 meters high. The third floor of the pavilion is a good place to enjoy a wonderful view of Dianchi Lake and the whole Kunming city. The bell pavilion is composed of 3 stories, each has 12 prop upturning eave horns and thus 3 stories have 36 prop upturning eave horns like a flock of flying phoenixes. Below the roof hangs a large bronze bell with a height of 3.5 meters. It is 6.7 meters in circumference and 14 tons in weight and was founded in the 21st year of the Yongle period of Ming Dynasty (1423 A.D.). It was originally installed in Xuanhua Tower at the south gate of the old city of Kunming to give time and warning to local people. It was moved to Guchuang Park when the bell tower was demolished in 1953. Later on it was moved to Phoenix Singing Hill, and finally, in 1983 it was installed in this pavilion specifically built for the bell. Scholars pointed out that this bell ranks fourth among the bells made in ancient China. The first largest one is in Beijing Bell Tower with a weight of 63 tons. The second one is in Beijing Tower Temple with a weight of 46 tons and the third one is in Nanjing Bell Pavilion with a weight of 23 tons. The bell was founded in the temple to release the souls from purgatory or expiate the sins of the dead in early Ming Dynasty for those who wrongly died in the Jingnan (Pacifying) Wars and the related political combing thereafter. The Yongle Bell in Beijing was founded by Yongle’s decree.The inner and outer sides of the bell were inscribed with the Lotus Sutra and 16 other Buddhist sutras amounting to 230,000 Chinese characters. It is said that each striking on the bell means a recitation of the sutras is done and all the wronged ghosts and souls were pardoned when sacrifices and praying were offered at the ceremony. The whole country followed Beijing and so the Yongle Bell in Kunming was built in 1423 A.D.
On the right side in front of the south gate of the Forbidden City is a camellia tree planted in 1602 named Butterfly Wing. This tree is one of the most well-known camellia trees in Yunnan. Each of its flowers has 9 pistils and 18 petals when it blooms in late winter and early spring and the whole tree is crowned with rich scarlet flowers. In 1983, a camellia garden was built on the north hillside of the Golden Temple Park to show the charm of Yunnan as a Kingdom of Flowers. The camellia garden covers an area of 10 hectares. More than 10,000 camellia trees were planted, all of them are well-known species from Yunnan, Sichuan, Guizhou, Guangxi Provinces and east part of China. The most famous species is the Golden Flower Camellia known as the “Queen of Camellia” in China. This garden ranks No.One in China in terms of its size and varieties. There is also an azalea garden and greenhouse nearby.